Now this is what I call being a GOOD NEIGHBOR. When you buy or rent a home you rarely know who your neighbor will be. You hope for good ones, usually measured by just keeping their automobiles off blocks in the front yard. Occasionally, neighbors end up being much more than acquaintances and can even become good friends. But what this neighbor did was above and beyond the call of duty. Elmore, who retired from the Army at 41 after giving 21-years of service was spending the night home alone as his wife and 3 young children are visiting family members in Indiana. According to Elmore, he wasn’t quite ready to go to sleep when he retired to his bedroom around 1:15 AM- so he decided to engage in one of his favorite activities – breaking down and cleaning one of his firearms. The firearm that Elmore decided to break down and clean was his M24 Sniper Riffle (officially referred to as the M24 Sniper Weapon System). “The firearm that Elmore decided to break down and clean,” said no Leftist EVER! At approximately 1:50 AM – after cleaning and reassembling the rifle, Elmore rested it on the sill of his bedroom window to adjust its scope. 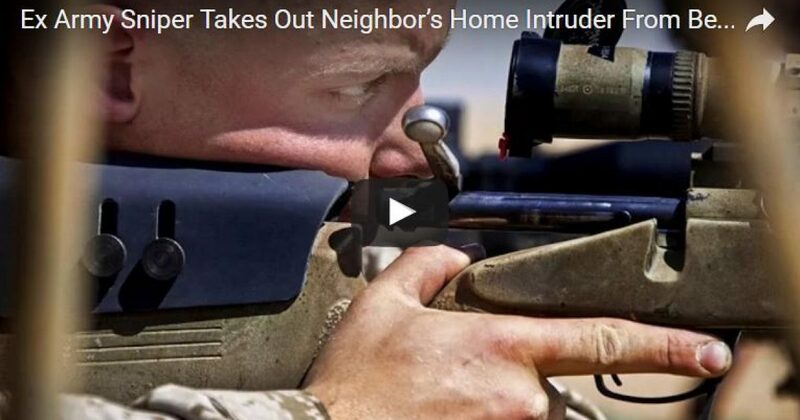 While adjusting the scope it unintentionally landed on one of his neighbor across the street’s open windows; Elmore told police and reporters that he was amazed at what he saw happening inside. Elmore told local ABC affiliate reporter Karen Lodestone, “I honestly thought I was dreaming hallucinating at first – it took over a minute for the situation to fully register in my brain”. What Elmore saw through the high-powered scope on his riffle was – his neighbors, Fredrick and Lydia Cole tied to chairs in their upstairs family-room. The couple’s 2-children Douglas (11-years-old) and Daniel (6-years-old) were sitting near their mother – also tied to kitchen-style chairs. Let’s stop for a moment and examine this story. Elmore is ex-military and has a rifle sticking out of his window. WWLD…What Would Leftists Do? Holy Guacamole, Leftists get the police to (1) shoot him on sight. Or (2) they send him to a concentration camp for wayward Conservatives. According to Elmore, the mother and children had what looked to be duct-tape around their mouths and 3 masked-intruders appeared to be focusing primarily on Fredrick Cole. The 3 masked-intruders were holding handguns and were acting in a very violent manner – often destroying the Cole’s property or striking Fredrick Cole in the face with their pistols. Things seemed to be escalating quickly at the Cole residence and Elmore used his bedroom telephone to call 911. After notifying authorities, Elmore continued to monitor the situation across the street. According to Elmore, while waiting for the police to arrive things continue to escalate rapidly at the Cole residence and he was greatly concerned for the family’s safety. Elmore told reporters that his military training and instinct kicked in and he knew that he had to do something to intervene. As we’ve learned from Professor Gates, we shouldn’t jump to conclusions on this. Perhaps the family was role-playing? Elmore could have shot thespians practicing their next roles? Turns out, that was not the case. Elmore proceeded to load his rifle with the custom 7.62 x 51mm ammunition and stationed himself at his bedroom window. As Elmore continued to watch the situation unfold across the street, the home intruders became increasingly more violent. As one of the intruders held his handgun (later identified as a .45 caliber Taurus 1911) to Mrs. Cole’s head – Elmore took the first shot from his rifle immediately striking his intended target. According to Elmore and members of the Cole family – the home intruder instantly fell to the floor dropping his weapon in the process. The remaining 2-home intruders were visibly stunned and confused by the incident and gave Elmore enough time to fire 2 additional rounds striking both remaining intruders before they had an opportunity to retaliate. As they say in sniper school: one shot one kill. 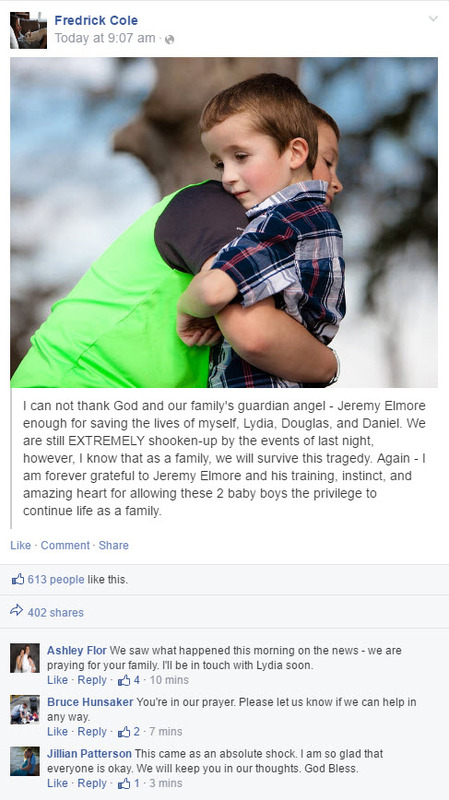 Kudos to Elmore for putting down the bad guys.